Time for Mass Resignations at Amazon? There is a concept in Jewish thought that God judges us in the manner in which we judge others. If we overlook a friend who slights us, God will similarly overlook our slighting of Him. If we judge someone else’s actions in the most favorable light, God will judge our actions in the most favorable light. If we go out of our way to help another person, God will likewise provide extra help for us. It would be lovely if our society adopted this idea. Anyone who insisted during the Justice Kavanaugh’s show trial that, “We must believe all women,” should be held to that standard even if they or someone they revere is accused. Meanwhile, in a similar situation, those of us who argued for upholding the rule of law and evidence would be given a fair hearing. On this basis, those who claim that any whiff of sexism condemns a person to the dungeons should now fall on their own swords. I am talking about Jeff Bezos and anyone, male or female, in a position of responsibility at Amazon. I realize that Mr. Bezos is having a rough time because of personal indiscretions as well as a change of business plans in New York. I don’t mean to pile on, but neither do I want to avert my eyes from egregious sexism at his company. Where do I find this? Alexa. Having spent a few days in an Alexa dominated home, I watched how the machine is configured in a way that demeans women. I’m not talking about Alexa transcripts uncovered from thirty years ago (since the program didn’t exist then), but how, in 2019, Alexa is laying a misanthropic vision for the future. Why is Alexa, or Siri for that matter, presented as female? This electronic wonder responds to commands issued to it. There is a most evident imbalance of power between the speaker and the machine. And the voice responding to instruction is female. Is a male voice too hard to simulate? Do we really think that the machine’s creators would have crafted a recognizably Mexican-accented voice, for example? Could the brilliant coders not have devised a way for the machine to insist on the words “please” and “thank you” before fulfilling a request? If my grandson said, “Alexa, turn on the light,” couldn’t she have said, “What’s the magic word?” What if every other time he wanted something he first had to say, “Alexa, is there something I can do for you?” As it stands, my three-year-old grandson, representative of the next generation of boys, is learning to bark orders at women, to expect females to respond instantly to his every whim and never to consider a woman’s perspective. While a bunch of white-garbed women made a ridiculous spectacle of themselves prancing arrogantly around at the State of the Union speech, surely the feminist standards they purport to uphold would be better served by destroying Amazon for this transgression? Keeping them out of New York City is small potatoes compared to completely eviscerating the company. As a side-benefit, this would bring many aspiring Socialists one step closer to their fantasies. Naturally, most Americans would be worse off and the economy might tank. But, hey, you can’t make an omelet without breaking a few eggs. P.S. Lest anyone not catch the satire of the above writing, I do feel the need to add a conclusion. I think that Alexa actually represents one example of a relatively serious problem in terms of our culture’s encouraging rudeness, self-centeredness and instant gratification. However, changing the voice to a male one would be equally problematic. All people should be treated with respect and suggesting that there are ‘loser’ groups who should be treated badly, whether they are women of color or white men, is a formula for failure. 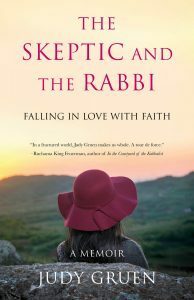 Did you catch my husband and my TV interview with Judy Gruen, author of The Skeptic and the Rabbi? 3 guesses who the rabbi is! I’m with you. I don’t even use those features. I don’t like to talk to machines. I prefer talking to people. Thank you, Kevin. The comments section was down since last night, so I am delighted to see that it is working again. I actually found it very creepy to be in a room with a machine listening to every word, though I have no confidence that my phone isn’t listening too. I have an Alexa and I have smaller children. (It was a gift as I’d probably never would have purchased it on my own.) At first I was so uncomfortable with not needing to say things like Please and Thank-you especially when I’d hear my children not saying them. Now, I guess, I have adjusted. But to be fair, my family is very aware of the fact that she is a tool and not a real person. Her voice being female is probably more due to studies showing women voices are more relatable to a greater number of people rather than sexism but I can totally see what you’re saying. For my family Alexa is a quick resource for music, fun facts, and letting us know “a package has arrived”. I love reading your thoughts on different things. Thanks always for sharing your views with such passion and intuition. I am always moved in some way. Tabatha, you’re absolutely correct that a woman’s voice is judged more favorably for the role Alexa serves, but since there are people jumping on anything and everything to label people as bigots, I thought it was fair play. Thank you for your kind words. I suppose the P.S. was necessary but, that’s sad. It’s like having to explain a joke. Self-censoring makes it feel like we’ve already lost and should just admit it and submit peacefully. Never mind, I was just enjoying your musing. Until the P.S., and what it means, slapped me down. I’m going to listen to Vladimir Horowitz amaze Moscow and get myself in a better mood. Jim, when I first wrote the piece it was entirely satire at the idea of the Left virtue police ending up eating their own, as has to happen. Under tyranny everyone is always guilty. Then, when I thought about it, I actually began to think that this does perpetuate rudeness to women and certainly teaches it to young children. But, as I said, being rude to men is no better. So, it wasn’t so much that I was worried people wouldn’t get the satire, but I began to think myself that this was more than satire. I don’t know if this makes more sense to you as it sounds rather convoluted to me, but I do hope you enjoyed the music at any rate. If a machine is an AI and is going to “act” human, have a human name and use a human voice, then “please and thank you” is appropriate. All things, even inanimate objects should be treated with care and respect. I think so too, Libby. This used to be well understood in Christianity also. People would remind each other to look at things from other points of view, to assume the best instead of the worst. The overall culture has lost it due to the relentless attacks on anything having real value. It is a sad loss, Libby. I am not disagreeing with it or you whatsoever … but can you sight any Torah* portion addresses for my benefit, that might help me more fully understand the implied concept please? Any hints would be helpful. Thank you. I’m going to have to track this back through ancient Jewish wisdom, Darrell. It is expressed in the oral transmission as, “In the way we judge others, God will judge us,” but I need to ask my husband to help me backtrack the path that led to that principle. This being the first Susan’s Musings that I’ve read, I didn’t have any expectations, but the tone of this article did seem to be a bit of a departure from what I’ve seen from you & Daniel so far. I’m glad you added that P.S. in there. On the first read through I was kind of thinking to myself “ugh, not more outrage. Isn’t the internet full yet”, but after the second read through… “ah, I got it”. That’s the bad part about text, they still haven’t invented sarcasm font yet. I recently went back home to visit my parents, and they had gotten some “Google home thingy” for Christmas… (=^/). We are setting our selves up for troubles in the future, and it’s sad to watch it happen in slow-mo. Aside from Hoovering up all the conversations in the room, I noticed that it was using more than its fair share of network bandwidth, and that Google services were able to zero in on me through a vpn. It’s fair to say that my parent’s network isn’t set up very well, but that kind of track-ability was something new. But, Seeing my dad try to interact with it, made for an interesting show. And, it was also a perfect illustration of your point… He can be a coarse man, when things aren’t going his way. Using Tech to teach people good manners is a great idea. Unfortunately, I think that most devs would just view this feature, as a UX friction point, as well as just… extra work. It’s generally believed that friction points dissuade people from using their product so devs work hard to get rid of them. This reminds me of a talk I heard some time ago about making bitcoin wallets more user friendly. The gist of it was that we need to stop solely concentrating on technical optimization, and start incorporating “tools that teach”. I’m glad you took a look at my Musings, Tim. It was a bit different than the way I usually write. You are correct, of course, that making things as easy as possible is a goal of tech developers. And, as well, that we haven’t begun to understand the effects of all this technology in invading our privacy and changing our lives. I hope you’ll keep reading.